It is a special moment to start a career in financial services. We are walking amid the ruins of the previous financial order. Fallen banks, broken markets, negative interest rates, shell-shocked economies and discredited theoretical assumptions. We see the enormous cost and impact to the welfare of society of a less than perfect financial system which has not kept pace with the advancement of our general knowledge and technical capabilities in most other domains. Yet the core of the financial industry is not a redundant function that can be ignored. Payments, savings and lending, insurance – to name some but a few areas – are absolutely required in a modern economy. Hence confidence in the finance industry must be rebuild and a key factor in restoring that confidence is a dramatic improvement in the discipline of risk management. Even while the financial system convulses, digital technology continues it inexorable march. Given what a simple smartphone can do these days, it is safe to say that already existing silicon technologies (as in chips and systems) and typical current network bandwidth already enables economic organization that is vastly different than anything we have had thus far. Our ability to safely adopt and deploy new forms of software that intermediates economic activity. Technology has profound implications on how we interact (see e.g. the data privacy debate) and risk manage our economic affairs going forward (see e.g. the massive online P2P ponzi scheme uncovered recently in China). How will this juxtaposition of booming technology and busted finance play out? Technological evolution is not a monotonic path. There are booms and busts, as people always exaggerate the pace and benefits of adoption. 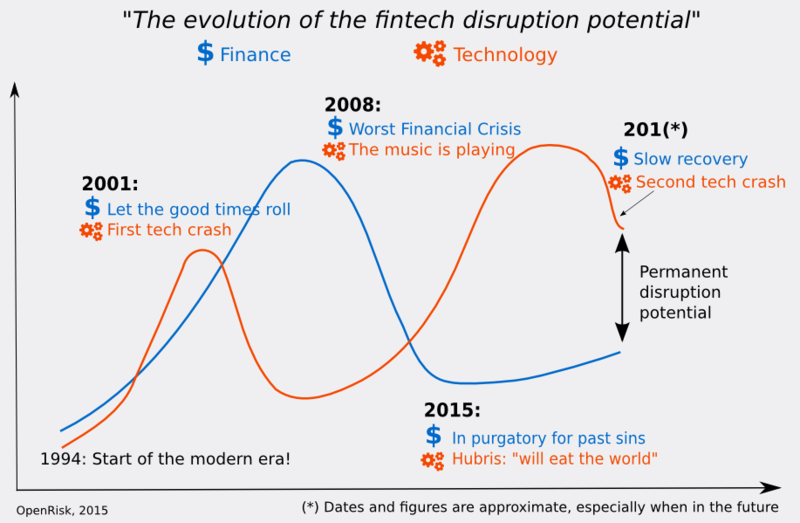 Yet even factoring an imminent crash in the tech sector, the disruptive potential that technology brings to financial services is by now a permanent feature of the landscape. In 10 years, our collective ability to use and abuse all types of information, but in particular financial data, will have completely transformed both the types of financial services required and the manner of their delivery. The reason is quite simple: our economy and finance requires an enormous book-keeping exercise. Technology is very good at this. Yet today payments, records of asset ownership, bilateral contracts and most other aspects of economic activity are still largely handled using Renaissance era technology such as the printing press and double entry accounting. Digitization is increasingly used, but in the first instance it mostly emulates old information management formats rather than explore and capitalize on the native capabilities of the new era. How do you prepare yourself for a career in the financial services of the future as opposed to those of the past? 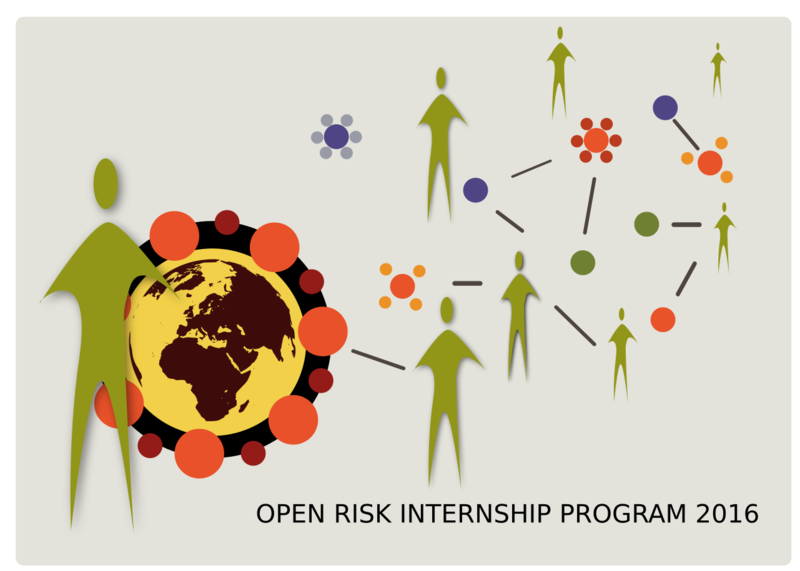 Most importantly, you do an internship with OpenRisk! …and invite applications from students in financial risk management to join us for a great learning opportunity. Dive into a fascinating world of open data, semantic web platforms, data visualizations and open source technology and their applications in risk management. A chance to hack together the open future of risk management! Too late for an internship? Help somebody else by sharing and forwarding this post!